Google Home Max is made for the ultimate in high fidelity listening and comes with Google Assistant. When listening to music on Google Home Max, you’ll hear all the layers of your music as the artist intended. 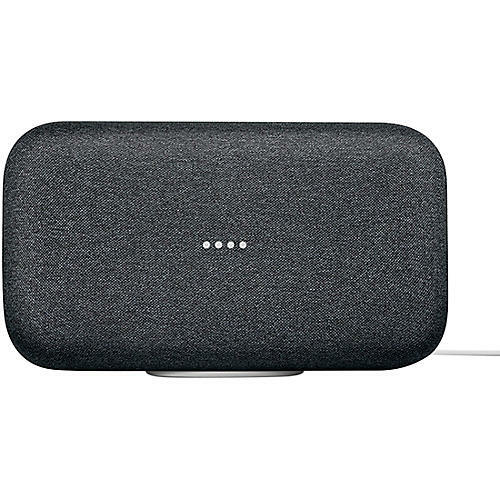 Google Home Max is the largest speaker in the Google Home series and is built for sound to please both audiophiles and casual music listeners alike. With Max, you’ll immerse yourself in deep round bass, rich balanced mids and crystal clear highs, enjoying a wide frequency spectrum from two exceptionally built 4.5” low-to-mid frequency drivers, and two 0.7” custom tweeters. Weighing in at 12 pounds, Max is built in a rigid housing to broadcast your music without rattle, shake, or any unpleasant distortion that could otherwise ruin your listening experience. An innovation to Google Home Max is Google's Smart Sound technology. With Smart Sound, Google Home Max uses machine learning to automatically adjust its equalizer settings to match the acoustics of your room. This gives you the best, most balanced sound wherever you place the speaker. 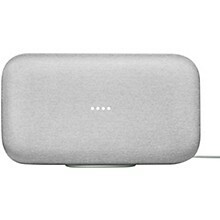 Being built for exceptional audio, Google Max is an excellent standalone speaker but it can also be connected to other Google Home products, placed throughout your home, to create an integrated Google Home smart speaker system. 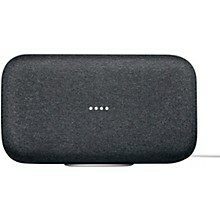 Like Google’s other Home speakers, Google Home Max has Google Assistant built-in and shares many of the same powerful features. It has six highly sensitive microphones with far-field voice recognition so Google Assistant can hear your voice commands from across the room. With these voice commands, you’ll search via Google; control other Chromecast-connected products; send directions straight to your phone; place hands-free phone calls; stream music from Spotify Free and Premium, YouTube Music, Pandora and more; and voice control 1000+ smart home devices from 150+ brands. Just say, “Hey Google,” and tell it what to do—the possibilities are endless. With a simple voice command, Google Home Max can play your own personal playlists from popular services like Google Play Music, YouTube Music, and Spotify. Plus, you can enjoy news, podcasts, radio and other services by streaming directly from your phone to Google Home. With your permission, Google Home will give you answers tailored to you for things such as your commute, flight information, and more. Plus, it’s a whiz at setting alarms, starting timers, and adding events to your Google calendar. Use Google Home Max to control your lights, thermostats, and switches from popular home automation partners. Google Home Max is compatible with over 1000 smart home apps such as Philips Hue, Wemo, Nest, tp-link, LIFX, geeni, Uber, Netflix, Dominos Delivery and so much more. Change your perspective on what a speaker can do—call or click to order.